My husband and I have been pretty transient in our marriage and have moved consistently every 2-3 years for work. For a girl who lived within a 2 mile radius her whole life, moving that much was tough for me! The first move took us away from all our family, then another move left us renting our home out while we lived 800 miles away from it! The most difficult move happened when when the twins were only 3 weeks out of NICU! After a while, I began feeling like putting down roots would never happen, and it was easy to get frustrated about being so transient. I spent more time than I care to admit, crying about how often we move, about leaving houses I fell in love with, and about not knowing where my kids would attend high school. We’ve been here for 3 years now, and true to form, my husband’s company has been talking about where they want to send us! First it was Florida, then Arizona, then Tennessee, then Colorado, then Arizona again. And all the while I wanted to get closer to our extended family, or just stay here! It was an emotional roller coaster! It was 6 months of being excited about one place only to have it pulled out from us again! 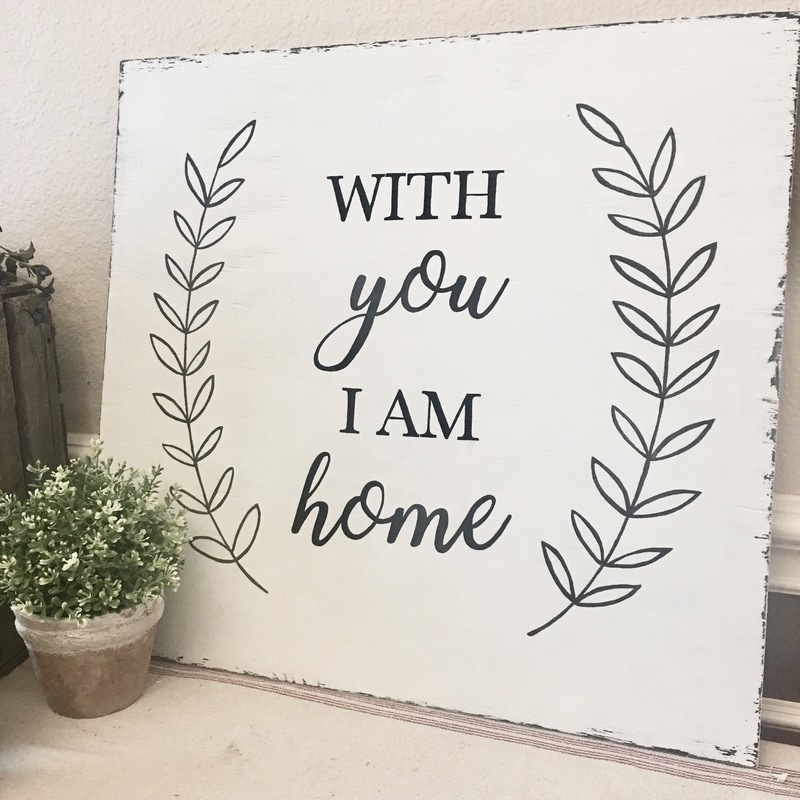 With You I Am Home! Those words touched me, and I began crying right there in the store! It was as if a million thoughts spoke to me at once and it made me realize what is really important. The location of our house, whether we rent or buy, the decor, the schools, and even how long we live there just isn’t what’s really and truly important. It’s who I live with that counts. My home is about my family. The bond and connection I create with my husband and my children are far more important than the location of my home. If everything I owned was gone tomorrow and we lived in a box, we’d be home because we’d be together. It’s my family that truly matters. I should’ve bought the sign right there, but my little DIY mind thought I could make my own and do it better! I found the wood at Lowes, painted it white and hand painted the letters. I gave it to my hubby as a Father’s Day gift to show him that I’m willing to go wherever his work takes us. That I’m done crying over our transient lifestyle, and that the location of my home isn’t the most important thing. These words remind me that it doesn’t matter if I live in a house for 2 years or 10 years. As long as I’m with my husband and my family, I will be home. Beautiful! Simply a perfect read. Thank you, Jodi, for this. We left Highlands Ranch in 2014, spent 1 year in Virginia, have been in NY now for 2 years, and are facing a move next year. After having been settled for so long, it hasn’t been easy. However, I have learned to love living life to the fullest no matter where I am. I haven’t shied away from making solid, lasting friendships, even knowing that I won’t physically be around much longer. I have sowed great seeds of friendships that will last beyond this life. I focus on my reunion in Heaven where I get to see everyone again for good and that helps. But focusing on our family as center of our “home”, wherever it may be, is such a great reminder. However difficult it is, appreciating all the experiences and especially being able to experience them together as a family is priceless. This quote helps ease my heart. Thank you again. P.S. Any chance you are making and selling these? I would like to order one. I’m so sorry to hear about your trials! Your perspective is inspiring. I’m really not the best at making these signs, and I’d be worried about messing it up for you. But I know there are some cuties on Etsy that could do one! Let me look into it and I’ll message you on FB! Girl… I get exactly how you mist feel leaving them! Sending you love!